They say that “getting there is half the fun”. But sometimes it’s more. A lot more. 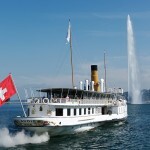 For example: a Lake Geneva cruise on a grand historic paddlewheel steamboat. Destination? Who cares? On a recent gorgeous Sunday afternoon, I, your intrepid reporter, along with my intrepid stepson and two intrepid nephews, provisioned with our intrepid bottles of wine, bread, cheeses and fruits, took a cruise on the stately Savoie, a svelte white steamboat that was first commissioned in 1914, and fully renovated in 2006 by CGN (Compagnie Générale de Navigation), which runs cruises all around Lake Geneva – see the full fleet here. Though tempted to splurge on the gourmet 3-course lunch, we knew we wouldn’t have time to enjoy it all since we also wanted to disembark in the beautiful French village of Yvoire. (OK, an enticing destination always helps.) So, after boarding with our First Class tickets, we asked the kind maître d’ in his starched black suit, where on the First Class deck we could lay out our picnic. He said he couldn’t offer us a normal table where lunch would be served, but suggested with a delightful conspiratorial whisper, that we head for the small tables at the front of the cabin. We did, and were soon toasting our good fortune to be sharing this fine nautical adventure together. Before long we dispersed to roam the elegant old steamboat. I was mesmerized by the churning red paddlewheel you can watch through a porthole. Passengers can also stand at a railing and observe the open engine room just below, where every piece of the revolving steel and brass machinery is polished to a Swiss sheen. In the window-lined restaurant area on the upper deck, diners enjoyed the gourmet lunch for this “Chef’s Table” cruise – lobster carpaccio with orange oil and carrot sorbet, chicken breast with fingerling potato fricassee and sautéed mushrooms, then a dessert of pistachio cake, hazelnut praline heart and passion-fruit sauce. All this with 5-star panoramas passing by from the middle of Lake Geneva. On the decks outside the cabins, you find an international mix of visitors and locals leaning in to the breeze, soaking up the sun and snacking on chips, sandwiches and drinks they’ve purchased onboard. Most passengers are there for the first or second time, but some locals who live near the various towns along the lake where CGN boats stop, buy a cruise ticket as a scenic alternative to a day at a lakeside beach. One American expat said she’s been coming on Lake Geneva voyages for 50 years. She has the Swiss train system’s General Pass that allows access not only to trains, buses and trams throughout Switzerland at no additional cost, but also to the CGN boats. 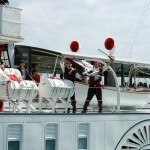 The Savoie is one of five handsome Belle Epoque paddlewheel steamboats operated on Lake Geneva by CGN. Three other similar paddleboats run on diesel electric power. CGN also offers cruises on modern motorboats, including one with hydrojet propulsion. But the grand Belle Epoque paddlewheel craft are the queens of the fleet. The 68-meter Savoie, which began plying the calm waters of Lake Geneva more than 100 years ago, stops at Geneva, Yvoire, Hermance, Nyon and other towns on its various cruises. CGN paddlewheelers also stop at towns farther east, including Lausanne, Montreux, Chillon, Evian and others. We stopped at Yvoire to enjoy a second lunch of fresh perch from the lake at Hotel Restaurant du Port. Then we strolled the cobblestone lanes lined with boutiques and cafés, an all-too-brief interlude before the Savoie returned to take us home to Geneva. I asked a crew member if we might visit the pilot-house and meet the captain. Soon, there we were, talking with Captain Patrick Schaffner, a CGN captain since 2012. He explained that it takes longer than we might think to turn around a 68-meter paddlewheeler. But he conceded that he has a very fine job indeed. “Sometimes we forget what a beautiful boat we have”, he said. Any passenger may ask for such a visit to the pilot-house. On a normal day with good weather, the answer is usually yes, though small children are not permitted. Back in Geneva, the boat docked, and we disembarked. Just minutes later, the graceful Savoie pulled away, already churning up new memories. CGN offers lots of cruise options: day or evening, gourmet meal or no meal, 1st class or 2nd, 35 various possible destinations all along the lake – or no destination at all. 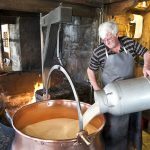 There are gourmet cruises that criss-cross the lake from various locations, and a Lavaux wine tour, which includes sampling local vintages. The gourmet cruise “Au Coeur du Patrimoine”, which starts in Lausanne and ends at the famous Château de Chillon, passes by the Lavaux vineyards, a UNESCO protected area, with its numerous picturesque villages. And, if you’re too busy working, there is no need to feel left out. CGN runs afterwork cruises which leave Lausanne every Tuesday and Thursday evening at 18:10. For a full list of possibilities click here.